On the twisting road that rises from the plains below to the ridges and plateaus of the Prades Mountains we pull over, in part to admire the steep green river valleys and the limestone cliffs curling away into the distance, but mostly to let our oldest son decorate the roadside scrub with the contents of his stomach. Since car-sickness is inevitable for him in these situations, he’s very calm and business-like about the whole thing, and I focus on the vistas in order to block out the retch-and-splatter noises emanating from his direction. 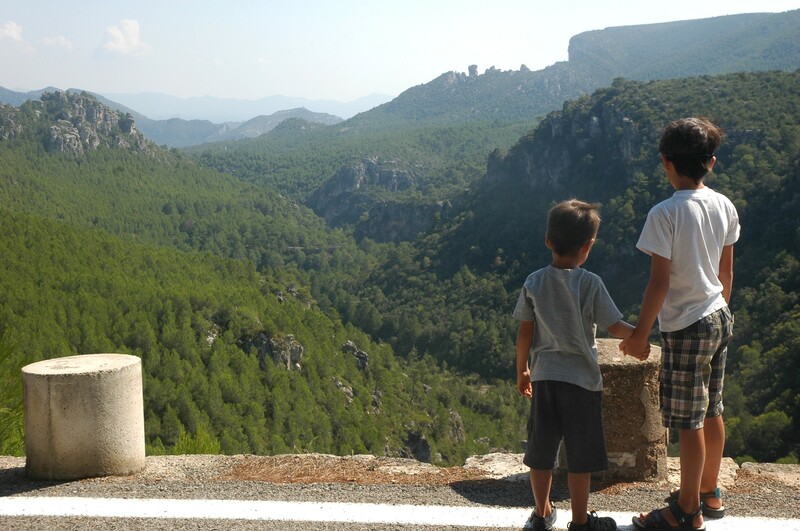 Don’t let my son’s pukishness put you off, though; the Prades mountains, less than two hours’ drive from Barcelona, offer up some of the most outstanding outdoor opportunities in coastal Catalonia. Dense mixed forest, caves, caverns, gorges and dramatic cliffs characterize this remarkably rugged and remote landscape that’s surprisingly untouched given its proximity to the often regrettable over-development of the coast. 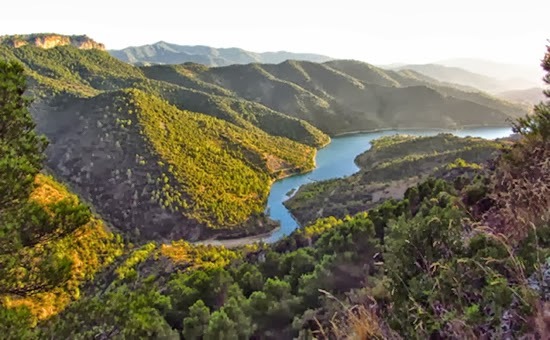 Having gotten a taste of the area on an anniversary wine-tasting weekend in nearby Priorat, we’ve returned several times and always found new delights around each bend in the road. And we’ve barely finished the aperitif, so to speak. The town of Prades, namesake of the sierra, is a charming little village nicknamed la vila vermella (the red village) in Catalan, so called for the characteristic red sandstone from which many of its buildings were constructed. Prades began its life in 1090 as a fortified Moorish outpost designed to resist the advancing troops of Ramon Berengeur III, Count of Barcelona. His successor, aptly named RB IV, forced the surrender of the town in 1153, and it was given a formal charter in 1159. Prades is an excellent base for exploring the area, but there is no lack of picturesque villages punctuating the landscape. 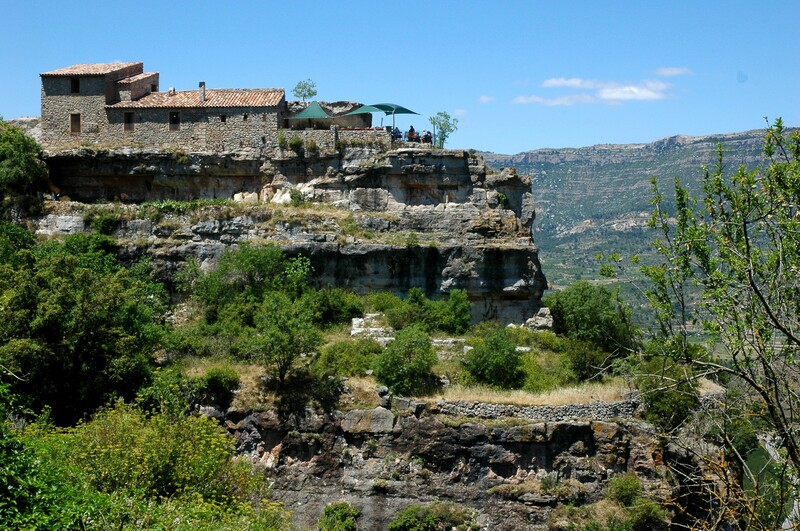 Farena is a typically quaint stone pueblo set atop a small hill, with excellent hiking paths along the Brugent River, which carves its way through precipitous limestone gorges. A fifteen-minute drive from Farena will take you either to Capafonts or Mont-Ral, depending on whether you fancy a left or right-hand turn, yet more scenic hilltop towns with fantastic walking trails. Not far from Mont-Ral lie the ghostly ruins of La Mussara, a medieval town that was finally abandoned to the elements in 1959. Local legend has it that the place was, and continues to be, cursed with all sorts of paranormal phenomena, but the most likely explanation of the exodus has to do with failed grape harvests and an isolated, aging population. 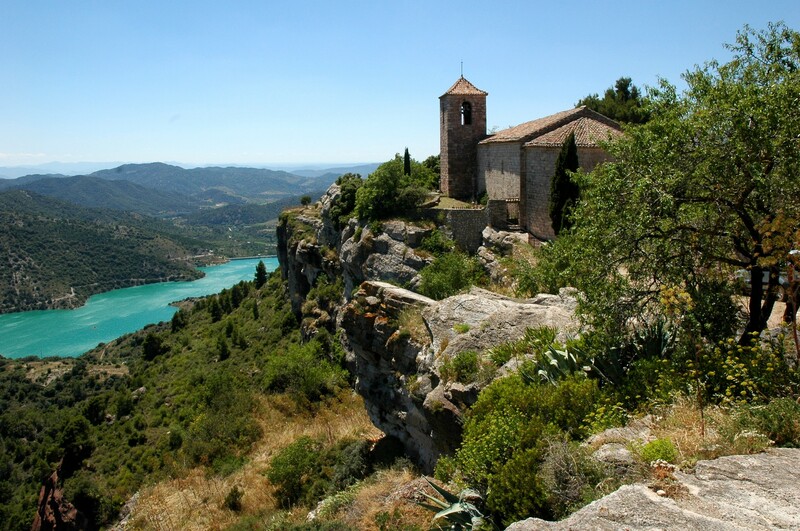 The brightest star in this rich constellation of panoramic towns, however, must be Siurana. Like Prades, Siurana was once a fortified outpost of Muslim Spain (don’t forget that the Moors ruled over much of the Iberian Peninsula for over 700 years), and the ruins of the Moorish castle lie at the entrance to this clifftop town. The vistas over the surrounding valleys and the lake below are spectacular, and in many other parts of the world there would be a parking lot bloated with tour buses. In Siurana, though, a dirt car park holds maybe 30 cars, and when we visited it was mostly empty. 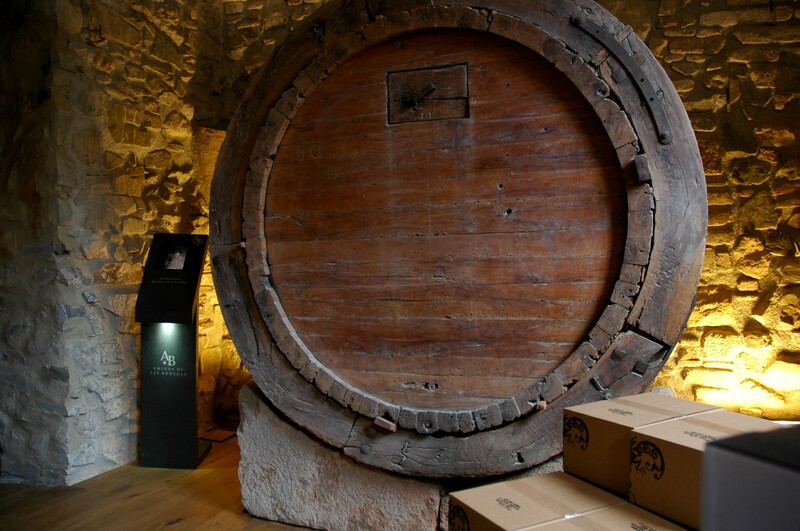 One of the marvelous things about the Prades Mountains is that there’s such a variety of activities. Serious climbers come for the innumerable routes afforded by the towering cliff faces. Those historically, architecturally, or theologically inclined take La Ruta del Cister – the Cistercian Route – a well-signposted and organized loop of ancient churches and monasteries. 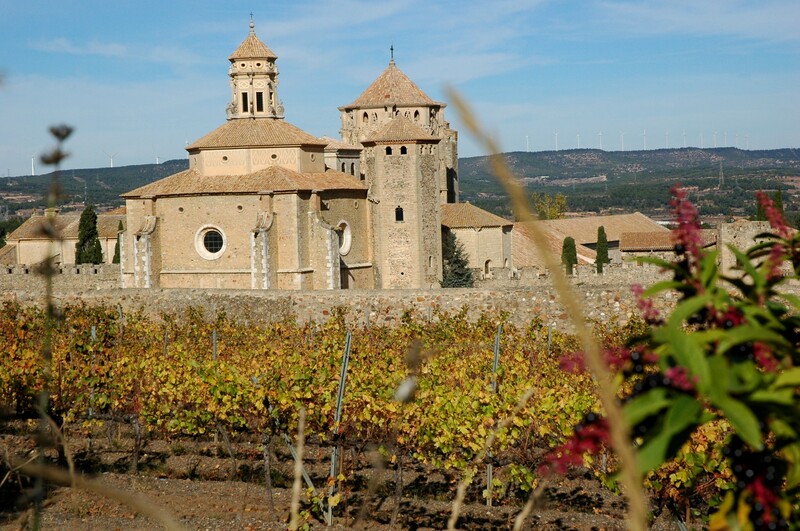 The largest and probably most well-known is the striking 12th-century monastery of Poblet, set on the northern slopes of the Prades mountains and a UNESCO World Heritage site. El Brogit Guiatges offers self-guided and guided tours, including wine, honey, and olive oil tastings, themed walks, active ecotourism, photography tours, mushroom collecting, and a lot more. The wine of the nearby Priorat region is absolutely gorgeous, and it’s easy to combine wine tastings with a bit of light trekking. Take the loop trail down to the valley of the Brugent River, where you’ll come across the ruins of a number of old mills which used the Brugent as a source of power. The crystalline stream drops through dozens of small waterfalls and curls around massive boulders. Keep an eye out for darting trout, marsh frogs, and crayfish in the river, yellow wagtails, woodpeckers, and other birds in the skies, and legless lizards under fallen logs. 4.3 miles (7 km). Easy. There are a number of trails to choose from that originate in this little stone village. Take your pick. There’s a popular gorge that runs from the headwaters of the Siurana River down through a series of falls, pools, and dramatic rock formations through which you can scramble, shimmy, and slide. For the most part you slip through the gorge along the stream, but at waterfalls and drops which would be suicidal to attempt to negotiate you veer off onto side trails that take you to even more astounding falls, pools, and dramatic rock formations. No doubt you’ll come across tadpoles and frogs along the river, and watch for viperine snakes out hunting both. 3.7 miles (6 km). Easy. The Fonts de la Glorieta hike is indeed a glorious one. Starting from just below the town, you make your way through mixed forest, hazelnut groves, and rocky outcroppings down into the gorge. Your first riverine stop is where the stream miraculously appears from fissures in the rock, and each deep green pool is more dramatic than the last. You can end your hike at the falls that shear off into the mist below, or continue on if you’re feeling adventurous. Here again, the pools are irresistibly enticing, but they are (and I can vouch for this) numbingly cold. 4.5 miles (7 km). Easy, but a long way back up. 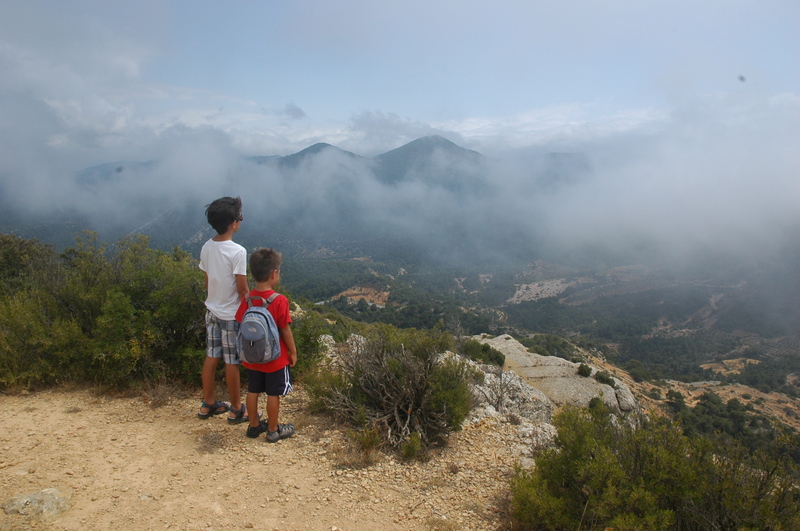 There are three campgrounds in the Prades Mountains. Now don’t imagine you’re going to some idyllically remote campsite with fire pit, picnic table, and not much else. Camping in Spain is much like staying at a nice hotel with uncomfortable beds. But for ease of use with kids, they do have their upsides. 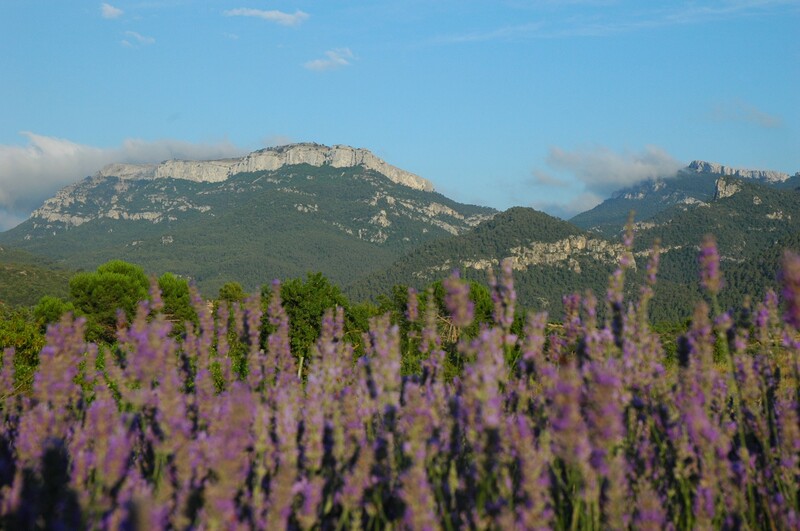 Camping Siurana is in an unrivaled spot overlooking the valley and mountains, right near the entrance to the village. WIFI, restaurant, bar, bungalows, bakery – you know, the basics. 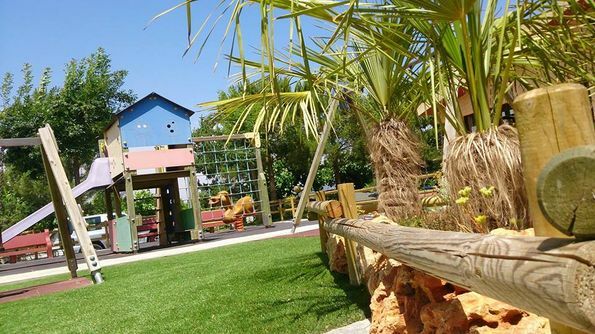 Camping and bungalow park Serra de Prades has all the amenities you’d expect, including a heated pool, sports facilities, playgrounds, a mini zoo, supermarket, etc. You can even take a scuba diving course in the pool. I’m not joking. Lovely views and good hiking on site. 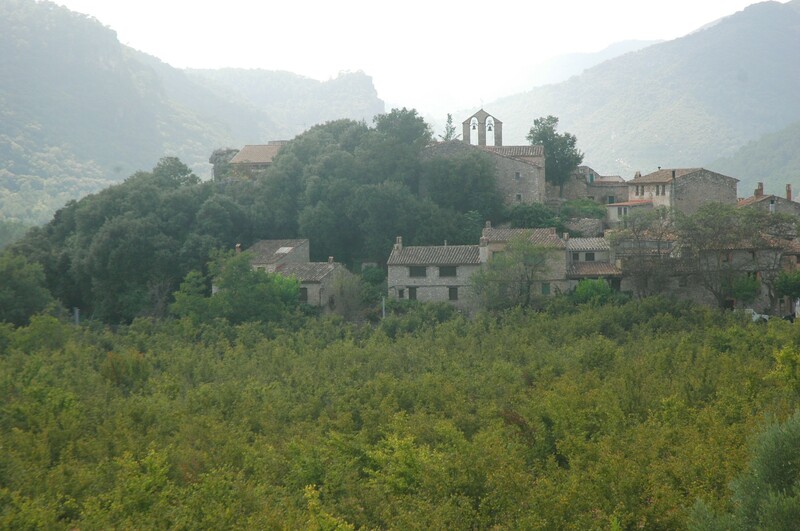 Camping Prades is adjacent to the town of the same name. Nice facilities and an excellent restaurant, but has less character and natural beauty than the others. In you’re not up for camping, holiday homes, cottages, and agrotourism options abound. EscapadaRural is an excellent place to start, with dozens of listings for the area. Toprural has an equal number of listings. You’ll also find accommodation listings on the Cistercian Route website, as well as at the less-slick but absolutely useful website that covers much of the region. If you’re visiting Barcelona or the surrounding region for any length of time and you’re looking for something outside of the well-worn Gaudi trails, consider going off-piste to the Prades Mountains. If you’re fortunate enough to live in the area, well, get out there and get exploring. Maybe we’ll see you there. I love to find spots away from the tourist areas (I say, as a tourist), especially an area so rich in things to see and do. Another must-vist from you. Thanks, Cuttlefish. Get on down here if you can! Such a great review about our territory! Thanks for mentioning us, we work hard to make our area known by tourists, from the Prades mountains to the Priorat wine region, and also Terra Alta, Els Ports mountain range, Llaberia-Tivissa-Vandellòs and Cardó mountain ranges… Such a high diversity in such a tiny place. We’d definitely love to do one of your tours at some point. You have great itineraries and ideas. Hope to see you soon! Thank you, we will be very happy to welcome you. We always says that “We are rich, but aren’t aware of it”. Maybe not rich in terms of money, but very rich in our highly diverse territory, here in the south of Catalonia but also in our whole country. Thank you again for your great article, it is very necessary to promote our unknown territory! Thanks, ahappylife! We’ve been here a year and haven’t even left Catalonia, but we’ve barely scratched the surface. You should definitely put Prades on the list. And thank YOU for stopping by and having a read. Cheers!